Affordable homes, a diverse community and plenty of green spaces make Carrick an attractive neighborhood in South Pittsburgh. When NEXTpittsburgh published an article on 5 Pittsburgh neighborhoods that first-time buyers should consider, Carrick made the list. It’s not only one of the most affordable nabes in the city, but also one of the most diverse, according to residents we interviewed. And more young people –loving the diversity as well as the convenience to the Southside and Downtown — are making it their home. Carrick is located in South Pittsburgh, bordering Whitehall and Brentwood to the south and Knoxville and the borough of Mt. Oliver to the north. Brookline and Route 51 form the western border while tiny St. Clair and Hays, home to the future Hilltop Urban Farm and Hays Woods city park, respectively, lie to the east. Named after Carrick-on-Suir, Ireland, Carrick was an independent borough for 20 years before it was annexed by Pittsburgh in 1927, following a vote by local residents. Many of the stately homes from this period stand today – a reminder that Hilltop neighborhoods were long the desired locale for workers looking to escape the South Side. Brownsville Road is the neighborhood’s main thoroughfare and is home to a Shop n’ Save, multiple pharmacies and banks, deli (Sam’s Sun), candy store (Esther’s), and several bars and pizza shops. You’ll also find the Historic Dairy District Marketplace on Brownsville Rd. with its large and beautifully designed pavilion by Desmone Architects. During the summer and a fall, a farmer’s market is held here every Wednesday, along with various other community events such as food truck roundups and flea markets. A nod to nearby Colteryahn Dairy, which was just bought by Turner Dairy, the idea for the Historic Dairy District Marketplace is to provide a space for events and gatherings and to attract similar businesses, such as an ice cream shop. The Marketplace, which was very much a commuity project, is also a sign that the neighborhood is on the rise. For recreation, Carrick boasts a number of green spaces, including Phillips Park, which features a disc golf course, swimming pool, walking trails, 12 acres of urban forest and a rec center with a state of the art gym. Dog walkers are a common site at South Side Cemetery and an adjacent softball field, Volunteers Field. Carrick is also home to a Carnegie Library, which will reopen in 2018 after extensive renovations and an expansion, and a bowling alley. Today, according to Niche, the average home value in Carrick is $76,199; the median rent $738 – nearly $300 cheaper than the nearby South Side Slopes. As for transit? Route 51 hugs the western border and provides a direct route to the Liberty Tunnels and Downtown Pittsburgh. The blue line stops inside Carrick at the Denise T station, and the Port Authority’s 51 bus provides service north to Downtown and south as far as West Mifflin, with arrivals every 15 minutes during peak periods. 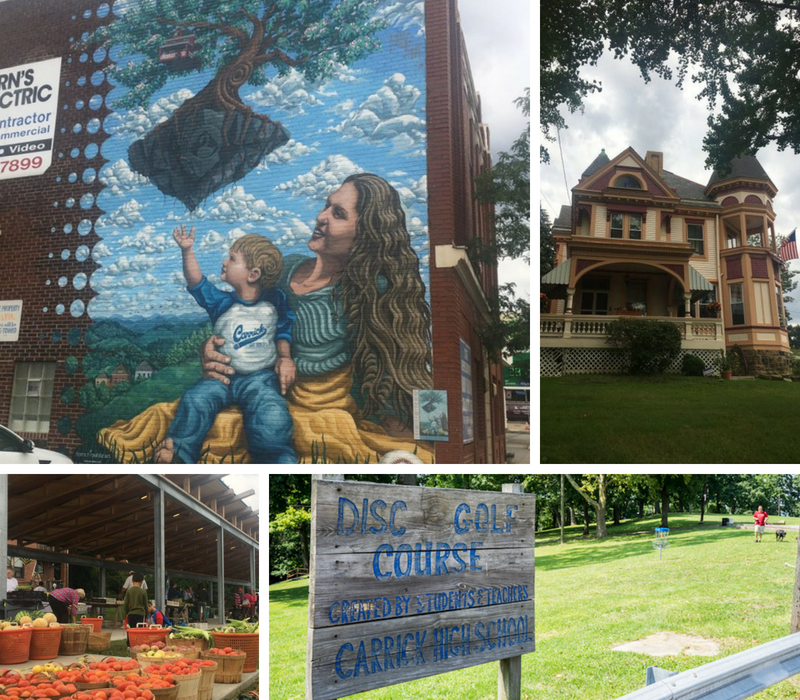 Check out many more neighborhoods in our Pittsburgh neighborhoods guides.